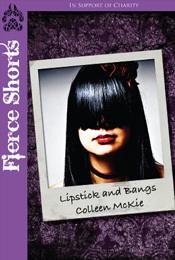 Posted in Book Reviews, Non-Fiction	by Cait H.
Colleen McKie brings readers back to her high school days in the early 90s with Lipstick and Bangs. It was a time of change in which she began to diverge from the interests of her lifelong friends to become an alt rock music girl with a bookish affinity for Stephen King. Lipstick and Bangs is the true story of navigating identity at an age when everything is weighed against the pressures of friendships and boys. In the crush or be crushed world of teen dating, can she be true to herself when she’s unsure of who that person really is? Lipstick and Bangs by Colleen McKie is the second Fierce Short from Fierce Ink Press that I have read and I continue to enjoy these little snippets of creative non-fiction. Partial proceeds from the purchase of this short will go to AIDS PEI. I definitely remember high school as a time when I was figuring out who I was, dated a few boys and formed my core group of friends (some I still talk to, some I don’t). Lipstick and Bangs was a wonderfully written short story telling of a time when the author is discovering her identity and maybe moving in a different path than those she’s close to. I really enjoyed the frank way Colleen wrote about her dating (mis)adventures and the self-discovery that came from them. I think this Fierce Short is one quite a few teens and adults will be able to connect with.